The ADS7863 is a dual, 12-bit, 1.5MSPS, Analog-to-digital converter (ADC) with four fully differential input channels grouped into two pairs for high-speed, simultaneous signal acquisition. Inputs to the sample-and-hold (S/H) Amplifiers are fully differential and are maintained differential to the input of the ADC This architecture provides excellent common-mode rejection of 80dB at 50kHz, which is a critical performance characteristic in noisy environments. The ADS7863 is pin-compatible with the ADS8361 but offers additional features such as a programmable reference output, flexible supply voltage (2.7V to 5.5V for AVDD and 1.65V to 5.5V for BVDD), a pseudo-differential input multiplexer with three channels per ADC and several power-down features. The high-speed, dual serial Interface is also pin-compatible with the ADS7861 while offering additional flexibility. The ADS7863 is offered in an SSOP-24 and a 4x4mm QFN-24 package. It is specified over the extended operating temperature range of -40C to +125C. 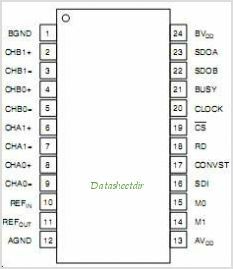 This is one package pinout of ADS7863,If you need more pinouts please download ADS7863's pdf datasheet. ADS7863 circuits will be updated soon..., now you can download the pdf datasheet to check the circuits!